Disney World: Should you stay on property or off? I guess it became a trick question when I included the phrase "an equal or superior experience". What is equal or superior for you? That is, what factors are most important to you? I will say that, for our needs, we came close with our choice of Floridays Resort Orlando. For your Orlando vacation, what is the order of importance of each of these items to you? Disney World properties are priced at a premium for the experience and conveniences. The hotels are classified from highest to lowest cost as Deluxe Villas, Deluxe Resort, Moderate Resort, Value Resort, and Campgrounds. As you would expect there is a variety of floor plans to accommodate larger groups just as there is for off-property hotels. It really comes down to whether you want separate bedrooms, each with its own door and full bathroom, or simply a larger room with extra beds and bed couches. The latter floor plan generally has one separate bedroom. Just be sure to count the number of full bathrooms...an important consideration with a large family. An obvious large family/group alternative is to get more than one hotel room. But that doubles the cost while a multi-bedroom suite offers a savings, sometimes a large savings. Since we selected Floridays Resort Orlando for our "off property" experience, let's compare it with an equivalent Disney World property. At Disney World only deluxe villas have multiple bedrooms, living room and kitchen (like a condo). Of those, the lowest cost options are Disney's Saratoga Springs Resort & Spa and Old Key West Resort. 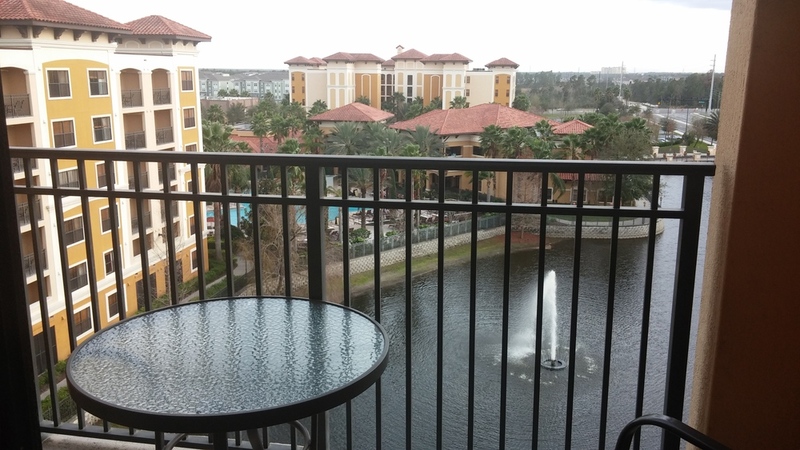 The furnishings and amenities, especially outside of the room (e.g., pools), are significantly more upscale at the Disney property vs. Floridays (as nice as it is), so look at the photos on their sites for each place for comparison. If you plan to spend most of your time at the theme parks like we did, then the hotel's exterior amenities will matter less. Rates vary according to the season. Please keep in mind that our visit was in the off-season (early February). Peak season cost is significantly more. A two bedroom villa, including tax, was $695.25 per night or 2,085.75 for a three-night stay. We did not consider a meal plan because our experience staying on property is that a meal plan just isn't worth it. We like more flexibility in where, when and what we eat. For more information about Disney World accommodations, see Disney World hotels with accommodations for larger groups. Making our reservation through Expedia (which saved $100 vs. making the reservation directly with the property), a two bedroom condo was $545.46...total...for three nights, or $181.82 per night. That included tax but not the new industry evil $13.78 per night "resort fee." Ask me how I feel about the deceptive practice of resort fees. Anyway, $695.25 vs. $181.82 is a difference of $513.43 per night. As I looked at the photos of each property, added the additional cost for a Budget rental car ($103 for three days) and fuel ($10), and took into consideration the additional time to drive back and forth to Walt Disney World (9.5 miles) instead of just walking to the nearest transportation spot from the Disney hotel...the difference of $1,540.29 for three nights made up for the Disney atmosphere that we missed in the early mornings and late evenings when we weren't at the parks. Theme park parking fees and toll road fees should also be considered. If you stay on Disney World property, then transportation is as friction-free as it can be. Disney provides comfortable complimentary motor coach transportation from the airport. And frankly, riding the Disney themed bus complete with video presentations right after arriving in Orlando does a wonderful job of ratcheting up the anticipation of the adventure to come. Monorail: We loved staying at the Polynesian Resort some years ago for a great many reasons, but one of those is that it is one of three resorts on the monorail line. We especially enjoyed it back when guests were allowed to ride in the very front. Our children loved skimming fast across the earth's surface with the spectacular view offered by the huge wrap around window up front. But even with the front car no longer being available for guests, the monorail provides the best transportation between resorts (the three that are on the monorail), Magic Kingdom and Epcot. Watercraft: Taking the boats is a ride experience itself. Don't miss the opportunity to relax on a boat ride across the lake between Magic Kingdom and Epcot, to lakeside resorts, or through waterways to Hollywood Studios and Downtown Disney. Motor Coach: Well, a bus is a bus, but it beats driving and they come around frequently. It always surprised me that the passage from one theme park to another via bus is longer than expected and crosses through territory that is outside of Disney property. Some area hotels offer limited complimentary transportation to theme parks in their area. It was too limiting for us, so we opted to rent a car. For example, Floridays Resort has complimentary transportation to Epcot at 8:10am, 10:45am and 12:15pm with return rides at 6:15pm, 8:30pm and 9:45pm. Most hotels do not offer complimentary transportation to/from the airport. A taxi to Floridays costs about $50 or a Mears limo is $22 per person. Floridays is 30-45 minutes from the airport. Floridays is conveniently located 9.5 miles from the Disney World ticket and transportation center (parking), and the drive is along an easy path...essentially one turn to get to WDW from the hotel. Some of the Disney hotels are farther away from the ticket and transportation center. Disney World spans a LOT of ground. Toll roads: If you rent a car you'll hit at least a few toll booths between the airport and your hotel. Ask when you rent your car if it comes with an express pass. If so you won't need to stop at the toll booths; instead, you'll be billed later along with a $4 per day "convenience fee." If you wish you can ask them to remove express pass and just stop at the toll booths. Parking: Parking at Disney World is $15 per day. The Univers`al Orlando theme park charges $16 per day or $22 for preferred (a little closer) parking. We spent so little time at the hotel that the exterior amenities were of lesser importance than expected. Maintenance construction was taking place at the main hotel pool area while we were there, so we were given a very nice room on the top floor (beautiful view) of tower C which put us away from the construction noise and near their "quiet" pool. From what I could see both pools were relatively small, but uncrowded. They do not come with the slides and mock-rock formations and other cool kid-stuff features found at WDW hotels including "Disney" atmosphere. Floridays has a fitness center, a small pool side café, a small game room, and a limited selection of nearby restaurants. Most important to us was the accommodations. The condo floor plans and amenities are essentially the same for each type of condo: one, two, or three bedroom. Our first impression was very positive. Our two bedroom condo was large and very nice. It includes a large kitchen and dining area, including a full size dining table, a closet with stacked washer and dryer, a living room area with hideabed couch, and a small balcony area with a view of the lake and fountain. One bedroom had two double beds and a full bathroom. Unfortunately the living room TV was broken. The master bedroom came with a king bed and large bathroom with Jacuzzi and separate shower. Folding panel doors opened a breeze way from the Jacuzzi to the bedroom and, thus, to the light from the bedroom window across the room. This arrangement offers an open non-claustrophobic ambience while relaxing in the Jacuzzi, but it comes with a cost. The folding panels offer about zero sound insulation between the bedroom and bathroom. Left-over hair and detritus in the Jacuzzi tub did not present a come-thither attraction. But after the first day my muscles were sore and tired and tense. So I did a personal cleaning of the Jacuzzi before settling in for a time of heated massaging relaxation. There is serious water pressure and volume from its spigot. The tub fills very quickly. Where is a shelf to set shampoo and such? There is none. Just the usual badly placed soap holder designed more for letting soap slide onto the floor than to be a holder and placed optimally for banging one's elbow. Its small surface area with ridges and slant simply does not allow placing bottles or anything else on it. To turn on the shower one must completely enter the shower. The shower knobs are at the far end. You have to redirect the shower head toward the wall, turn on the water and quickly get out while the water warms up. Weak water pressure, presumably from a water saving shower head. The water would not turn off, even with muscle applied to the knob. So our evenings were accompanied by the sweet sounds of dripping water all night. I was frankly impressed at the amount of apparent effort invested by some room designer to absolutely maximize the inconvenience of this shower. An amazing feat for wet feet. In the other bathroom, the hair dryer tried to catch on fire while our daughter was using it. So we shared ours. Not a problem for me since I need one all of about 5 seconds. I never found the ice machine (too tired at night to go looking—but it turned out it was a couple of blocks away at the pool side bar) and our refrigerator's freezer did not have ice cube trays. But we picked up some soft drinks and kept them cold in the fridge. For those of you who are not aware of the taste (and smell) of potable water in Florida—just trust me. Bring bottles of water and soft drinks. 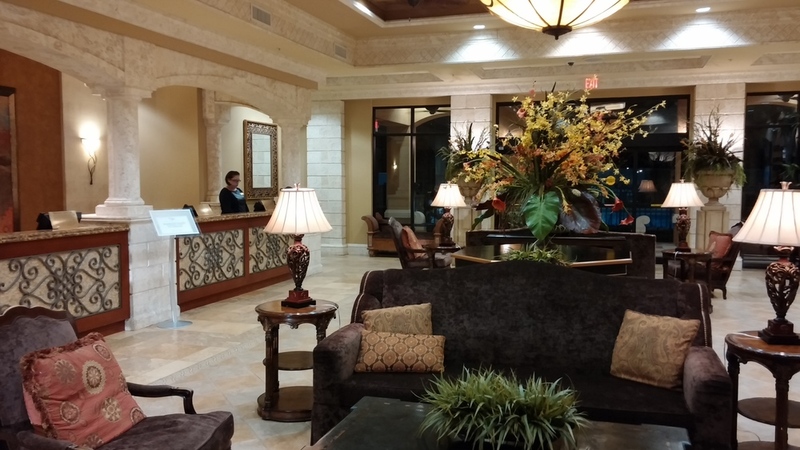 See a few more of our Floridays Resort Orlando photos at the end of this article and visit their website for many more. If this is at the top of your priorities, then stay on WDW property. When we stay on site we really enjoy the convenience of nice evening walks, finding the hotel's quiet pool (some hotels have a pool that is away from the main traffic). There we can relax and read a book as the sun sets behind beautiful palm trees growing in professionally groomed sand and grass. WDW hotels that have widely spaced buildings (like Coronado Springs) provide periodic transportation via golf carts or larger equivalents to/from the outlying buildings. For us it was a short walk to the main building that has check-in clerks, restaurants, bands, shops, etc. At Coronado Springs Resort we enjoyed evening walks to dinner with an outdoor stop to enjoy the Mexican style steel drum entertainers. Guests who stay on WDW property also enjoy admittance to one of the theme parks (rotates daily) an hour early during which time attraction lines are short or non-existent. With the convenient transportation options also comes an easy visit to Downtown Disney with all of its unique shops, dining, and entertainment. We thoroughly enjoyed spending time there on our last trip to WDW and highly recommend it.